When promoting your website using Google Adwords, sometimes you want to ensure that calls for certain keyword searches or ads get routed to the correct destination. This is easy to do using Google's ValueTrack parameters and Retreaver number pools. Configuring an AdWords ad to pass the creative and keyword to a landing page. Edit your Google AdWords ad's destination URL to include the ValueTrack parameters that you want to route on. In the example above, we're passing in the creative ID as ga_creative and the keyword as ga_keyword. 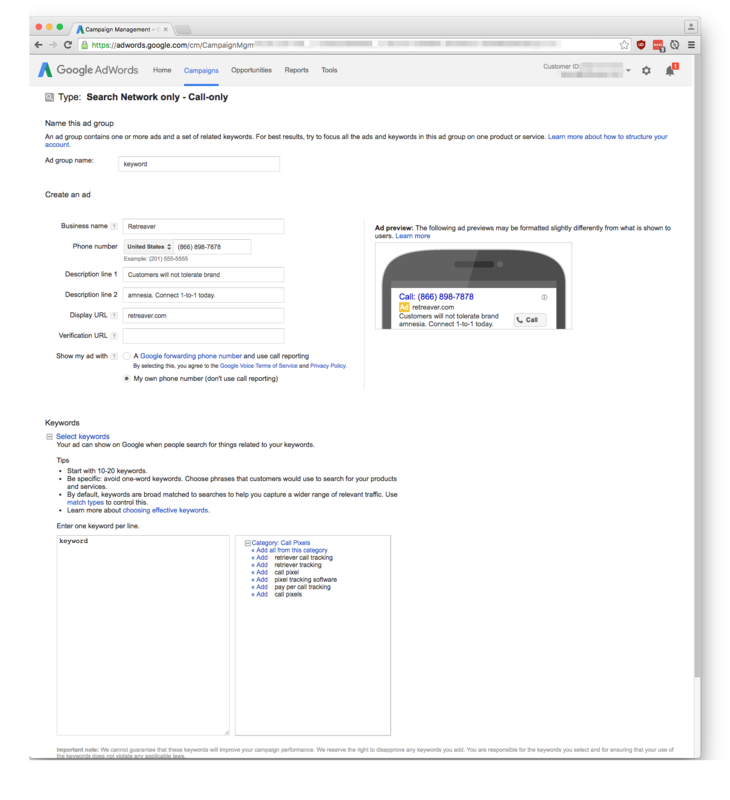 Adding Tags in Retreaver (left) to detect from the landing page URL (right). View your campaign, and select the Settings tab from the Dynamic Number Insertion section. Here you will configure how Retreaver should detect the ValueTrack parameters that you are now passing to your landing page. As shown above, whenever a visitor clicks through to your page via one of your AdWords ads, we'll attempt to detect the values of the ga_keyword and ga_creative tags. You'll need to have a Number Pool configured for your campaign in order to use this feature. Because we are tagging numbers dynamically as visitors reach your landing page, you might need a large number pool depending on the number of unique keyword/ad combinations that you want to track, but limited to the number of concurrent visitors you expect. Once the visitor calls the number that is displayed, we automatically tag the call with the Google AdWords tags that have been set on the number. In order to get the creative ID that will be passed to our landing page, we need to enable the Id column in AdWords. Now that we are passing the creative ID and search keyword to our landing page and detecting it in Retreaver, we need to tag the Buyers on our campaign. You can retrieve the AdWords creative Id for your ads by following the instructions above. Adding a Google Adwords creative Tag to a Buyer. Edit the Buyer you want to tag, and add the tags to the tag list. In our case, we've tagged a Buyer with ga_creative:17394206701 because we have a special ad that's promoting Google AdWords call tracking and we want to be sure the we know what the caller is calling about. To do this, we've also added a bridged ping tracking URL to our campaign, informing our operator that the caller is calling about AdWords. If you have only one Buyer tagged with the tag, you can add a bridged ping tracking URL which is tagged with the ga_creative tag instead of the buyer_id tag, it's up to you. Sometimes you have high-value traffic that you want to ensure only gets to your best call buyers, or sales representatives. Perhaps you have a Google Adwords campaign running and you want to make sure calls from that campaign are treated specially. Add any parameters you want Retreaver to sniff for by editing your Default URL Parameter Sniffing as outlined in this article. Next, we configure the Retreaver.js script to detect the source parameter in the landing page URL. You'll need to have the script somewhere on your landing page for this detection to happen. Navigate to your campaign and click the Settings tab in the Dynamic Number Insertion section. Enter source as the tag key and URL parameter, and update the campaign. Now whenever someone visits your site, we'll automatically check the landing page URL for the source parameter, and set the source tag if it is found. For this to happen, you'll need to have either a Number Pool configured for your campaign, or numbers configured and tagged individually with each possible source tag that you want to use. Adding a source tag to a Buyer. Finally we add the source:ga tag to our Buyer, ensuring that any Google Adwords calls get routed to it only. Perhaps they are specially trained on handling calls from your AdWords campaign, or it's a buyer that pays you more for these high-value calls. The only way to pass keywords into Retreaver from Adwords Call-Only ads is to set up a static phone number in Retreaver tagged with each keyword, and then in Adwords set up a corresponding Ad Group using that phone number and that single keyword. This has potential to be somewhat tedious. Feel free to contact support@retreaver.com for assistance setting it up. We would also love to know how you're using it and what needs Retreaver is filling. Knowing this would go a long way toward helping us automate using Google's Adwords API.